Ross Point (“Palmetto Point”). Double-click the photo to see it enlarged. Photo by Edward G. Harris. Used by permission of Holly Hill Historical Museum. Today if you drive in Holly Hill along Riverside Drive, just north of 3rd Street, you can park close by the bank of the river in a little park named Ross Point. William Wallace Ross arrived there by boat 146 years ago, just two months after his brother, Edmund, a Kansas senator, had cast the deciding vote that stopped President Andrew Johnson from being impeached and removed from office (“Ross Family”). Ross was meeting up to partner with his brother-in-law, Samuel Peter Wemple (Wimple), who was just then planting an orange grove where Holly Hill is today, and Wemple also had plans for a sugar plantation along this west bank of the Halifax River, so Ross invested in this joint enterprise; and by July 21, 1868, Wemple already had federal permission for a post office which was officially named Palmetto Point after the home site where the land jutted out as a short, rounded point into the river. Today, this is part of Holly Hill. [The spelling is “Wemple,” according to the “Ross Family” website (created in Rossville, Kansas). The Wikipedia “Holly Hill, Florida” article spells it “Wimple.”] (“Holly Hill”; “Ross Family”). To the south of Palmetto Point, the Halifax River washed the shores all the way to Mosquito Inlet (Ponce Inlet) with no towns anywhere. To the north of Palmetto Point along the Halifax, no towns existed, though a handful of people lived in the Tomoka Settlement along the Tomoka River [where the Tymber Creek subdivision is today]. There were no roads along the river because there was nowhere to go to, except by boat. Holly Hill was not yet a dream, but neither were Daytona and Ormond. In 1868, when William Wallace Ross came to what would become Holly Hill, he was 40, but he had already lived a fulfilling and adventurous life, and Florida’s dangers were nothing like what he had experienced as a young man. 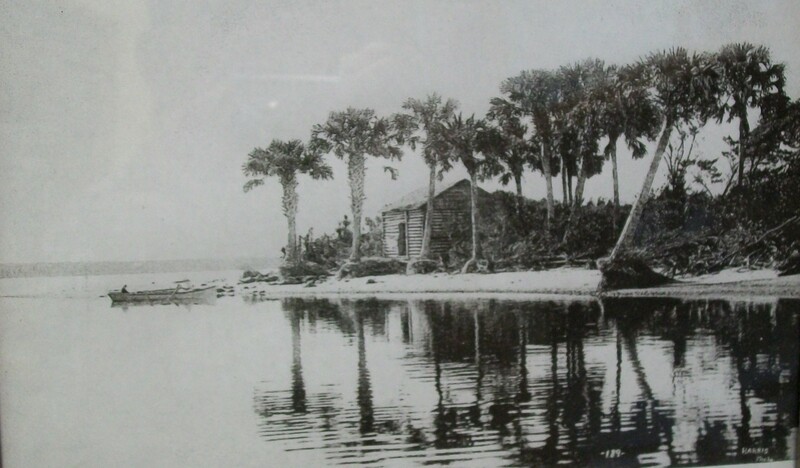 Here in Volusia, the Native Americans had been forcibly removed thirty years earlier, after the Third Seminole War, so Holly Hill’s brave, pioneer settlers (though willing to risk everything in this isolated land) mainly had to confront mosquitoes and freezes and surprise hurricanes (“Ross Family”). Twenty years earlier, when Ross was only 20, in 1848, he had moved to the Indian Territory as a pioneer on the Pottawatomie Indian reservation, just to the west of the state of Missouri. This was a time when slavery was a deadly political question in Indian Territory, and the Kansas-Nebraska Act of 1854 didn’t bring peace when it allowed residents to decide if Kansas would be a free state or a slave state. Instead, thousands of non-resident pro-slavery people from Missouri flooded into Kansas Territory, and Ross moved with his young wife to Lawrence, Kansas, in 1855, a new “free soil” town of northern immigrants who wanted the Kansas Territory to become a free state. Also with Ross in Lawrence were his young brother and sister and also her new husband, Simon Peter Wemple (also known as Samuel Peter Wemple), the brother-in-law who would later partner with Ross to homestead in what would become Holly Hill (“Rossville”; “Bleeding Kansas”; “Ross Family”; “Holly Hill”). In October 1855, Ross briefly left Lawrence, making a 25-mile journey to assist John Speer with printing presses at the Topeka Constitutional Convention, but during that same month abolitionist John Brown and his sons came to Lawrence to help the fight against slavery, and on November 21, a Free-Stater was shot dead a few miles south of town. By early December, Ross was working with Speer to publish the Kansas Tribune in Lawrence, but then on December 6 another Free-Stater was killed near Lawrence, so on December 10, Ross and Speer moved the Tribune to Topeka. Three months after Ross moved 25 miles away, John Brown and his sons slaughtered pro-slavery Missourians in the “Pottawatomie Massacre” as retaliation for a raid against Lawrence, and Kansas Territory came to be known as “Bleeding Kansas” (“Ross Family”; “Bleeding Kansas”; (“John Brown”). Before coming to Volusia, Ross had served as a delegate to Kansas’s state constitutional convention in 1857 and at the 1860 Republican National Convention that nominated Abraham Lincoln, and then just as the Civil War was beginning in April 1861, Ross was stationed in the White House East Room as a member of the Frontier Guard, protecting the new President; and before the end of the month Lincoln appointed Ross to be the federal agent for the Pottawatomie Indians at St. Mary’s Mission, Kansas, where he had lived in 1848. Immediately following the war, Ross was elected mayor of Topeka. (“William” geni.com). In 1867, Ross was in Jacksonville, working as a lighthouse inspector, but he contracted (and survived) cholera in November (“Ross Family”). By March 1868, Ross’s brother, Edmund (Kansas senator) was actively involved in the impeachment trial of President Andrew Johnson, and as the trial was drawing to a final vote, William Wallace Ross travelled to Washington, D. C., and according to Edmund’s biography, William refused a bribe of $20,000 just to reveal which way his brother planned to vote. When his time to vote came, Republican Edmund Ross stood, and the crowd was breathless because they knew that his one vote would determine if the Democrat President would be removed from office. Ross announced, “Not guilty” (“Impeachment”; “The Trial”; “Edmund G. Ross”; “Andrew Johnson”). William Wallace Ross then came to Palmetto Point (later, Holly Hill), joining his sister’s husband on their joint venture of 200 acres of orange trees which were assessed at $600 on the 1869 Volusia tax rolls (“Holly Hill”). In May of 1870, another Northerner was reconnoitering along the Halifax River, looking for land to buy to establish a community. Mathias Day from Ohio was getting a river tour by John Bostrom, a Swedish settler whose peninsula home [just south of today’s Granada Boulevard in Ormond Beach] was one of only three houses on the “beachside” from the inlet north to present day Ormond Beach. Day made a note about Ross’s and Wemple’s homestead, commenting in his diary that behind palmettos on the west bank of the Halifax River was an orange grove. No doubt, this encouraged him with the prospects of this region, and he purchased land three miles farther south along the west bank of the river and founded a small community that six years later would be named for him–Daytona (“Holly Hill”). Just two months after Mathias Day spotted Ross’s orange grove, the Palmetto Point post office was discontinued on July 12, 1870, but I have found no indication if Wemple left Volusia at that time (“Holly Hill”). During that same year, forty-two-year-old Ross married thirty-two-year-old Sara S. Betts, and according to Ross family records, she and Ross were both at “Palmetto Point” by November 1870, braving the wilds of the nearly uninhabited Halifax River (“Sara S. Betts”). The 1870 Federal Census of Volusia County, however, has no listings of any people named Ross, Wemple, Wimple, or Betts, so it may be that the census information was collected when Ross was up north (U.S. Census). We do know that Ross and Wemple’s orange grove was destroyed by freezing. It may be that a freeze in early 1871 killed off their fledgling orange grove, but major freezes did not hit this area in 1870 or 1871 (“Birth”; “Holly Hill”). During the fall of 1871, apparently the Rosses were in Albany, New York, at Sara’s parents’ home, and it was there that she died on October 9 when she was only 33 (“Ross Family”). In 1876, new settlers arrived in what was later to become Holly Hill, but there is no record that Ross ever returned to his orange grove along the Halifax River. In 1881, Ross was honored by the little Kansas town where he had been a pioneer on the Pottawatomie Indian Reservation back in 1848. The town chose to take the name of Rossville, as it is still called today (“Rossville”). Ross’s “Palmetto Point” had new settlers about thirty years after Ross and Wemple left their orange grove. I. M. Mabbette and his family lived, not on the point itself, but on the west side of today’s Riverside Drive (from about 1896 to 1904); and for some years the little point of land was known as Mabbette Point. Later during the twentieth century when the Halifax River channel was being deepened by dredging, the “spoil” sand was added to the point, and on February 26, 1958, the Holly Hill City Council officially named this historic landing site Ross Point Park and further memorialized Ross, one of Holly Hill’s earliest settlers, with an historical marker that remains there today (“Ross Point” display; “Holly Hill”). June 5, 1889–Ross died of stomach cancer while visiting his daughter, May, in Los Angeles. He was 60 years, 162 days old. (“Ross, William,” politicalgraveyard.com). Buried in Evergreen Cemetery, Los Angeles, California. (“Ross Family”; “William Wallace Ross,” geni.com). “Andrew Johnson.” April 11, 2014. http://en.wikipedia.org/wiki/Andrew_Johnson (accessed April 22, 2014). “Birth of a Settlement, The.” City of Holly Hill website. 2011. http://www.hollyhillfl.org/about/history (accessed April 21, 2014). “Bleeding Kansas.” April 21, 2014. http://en.wikipedia.org/wiki/Bleeding_Kansas (accessed April 21, 2014). “Edmund G. Ross.” April 4, 2014. http://en.wikipedia.org/wiki/Edmund_Ross (accessed April 21, 2014). “Holly Hill, Florida.” April 13, 2014. http://en.wikipedia.org/wiki/Holly_Hill,_Florida (accessed April 16, 2014). “Impeachment of Andrew Johnson.” April 15, 2014. http://en.wikipedia.org/wiki/Impeachment_of_Andrew_Johnson (accessed April 21, 2014). “John Brown (Abolitionist).” April 17, 2014. http://en.wikipedia.org/wiki/John_Brown_%28abolitionist%29 (accessed April 21, 2014). “Ross Family in Kansas, The.” February 21, 2003. http://www.kawvalley.k12.ks.us/rossville_kansas/history/ross_family.htm (accessed April 19, 2014). “Ross Point” display. Holly Hill Historical Museum. April 16, 2014. “Ross, William Wallace (1828-1889).” January 9, 2014. http://politicalgraveyard.com/bio/ross.html (accessed April 19, 2014). “Rossville, Kansas.” April 18, 2014. http://en.wikipedia.org/wiki/Rossville,_Kansas (accessed April 19, 2014). “Sara S. Betts.” n. d. http://records.ancestry.com/sara_s_betts_records.ashx?pid=142225389 (accessed April 19, 2014). “Trial of Andrew Johnson, 1868.” February 21, 2011. http://www.eyewitnesstohistory.com/john.htm (accessed April 21, 2014). U. S. Census, 1870. July 23, 2004. http://us-census.org/pub/usgenweb/census/fl/volusia/1870/indx-r-z.txt (accessed April 21, 2014). “William Wallace Ross.” n.d. http://records.ancestry.com/william_wallace_ross_records.ashx?pid=135812616 (accessed April 19, 2014). “William Wallace Ross.” n. d. http://www.findagrave.com/cgi-bin/fg.cgi?page=gr&GRid=10086 (accessed April 19, 2014). “William Wallace Ross (1828-1889).” December 8, 2010. http://www.geni.com/people/William-Ross/6000000003881942489 (accessed April 19, 2014). Thank you again Denny for enlightening us on our local history and heritage!